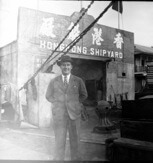 HF: Harry Kin Hong Long divided his life between New Zealand and Hong Kong. In the latter he worked for two companies, Kung Lee Steam Ship Co. and HK and Yaumati Ferry Co.
Harry’ s daughter, Judy Chan, has kindly sent a considerable amount of biographical detail about him. 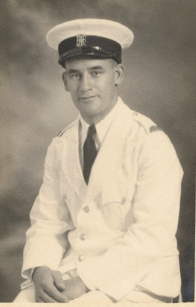 In this article I have extracted that which relates directly to his employment in these two companies plus other relevant information, and also to the time he served in the Essential Services Corps. Hong Kong. I have also incorporated, with the author’s permission, further information extracted from Julie Bradshaw’s book. Harry was born on the 25th January 1900 in Ahaura, NZ and died on 16th May 1984 in Auckland. 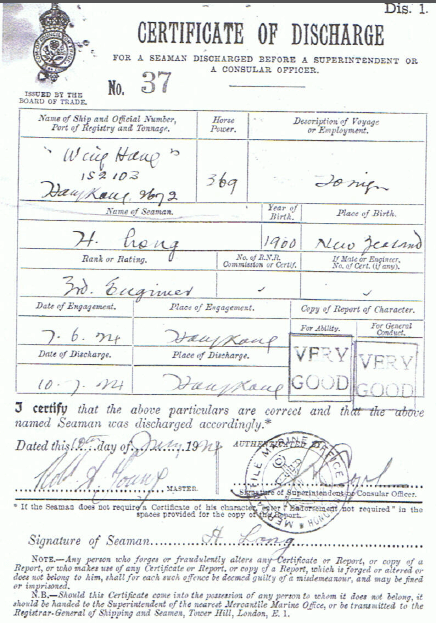 On 8th May 1922 he passed the Certificate of competency from the NZ River Service certifying Harry as a River Engineer. He received certificate # 2363 on 6th July 1922 from the Marine Department of NZ in Wellington. On 9th December 1922 he received the Deepwater or Home Trade Certificate asa Second class engineer # 510. On 18th December 1922 he received the Second Class Engineer Certificate after attending correspondence classes via McVicar’s Engineering School. 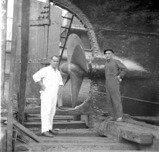 In 1923 Harry went to work in China working on the River Steamer from Canton up the West River. 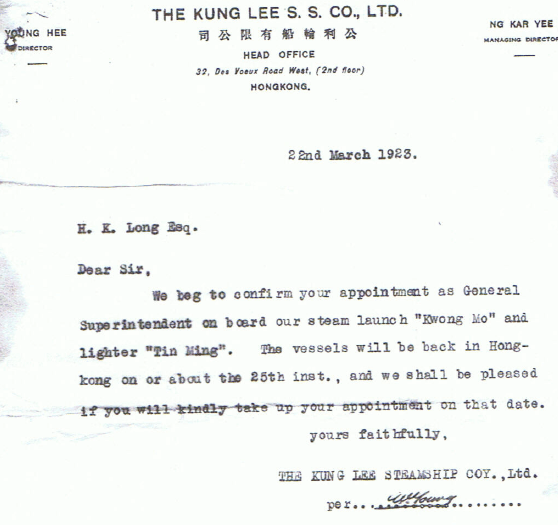 On 22nd March 1923, Harry received a letter confirming his appointment as General Superintendent on board the steam launch Kwong Mo and the lighter Tin Ming. 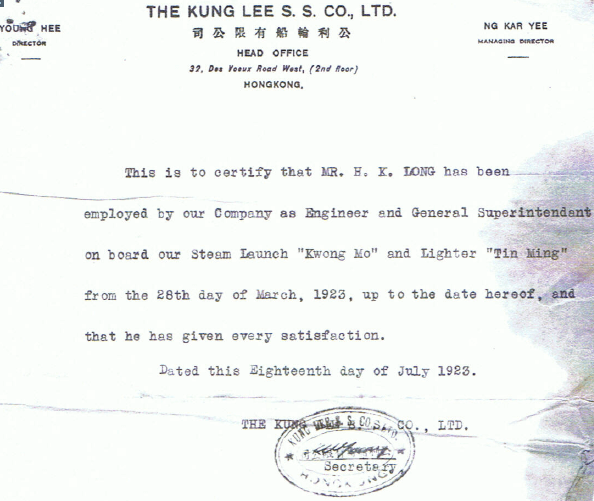 On the 18th July 1923 Kung Lee Steam Ship Co presented this record of employment. 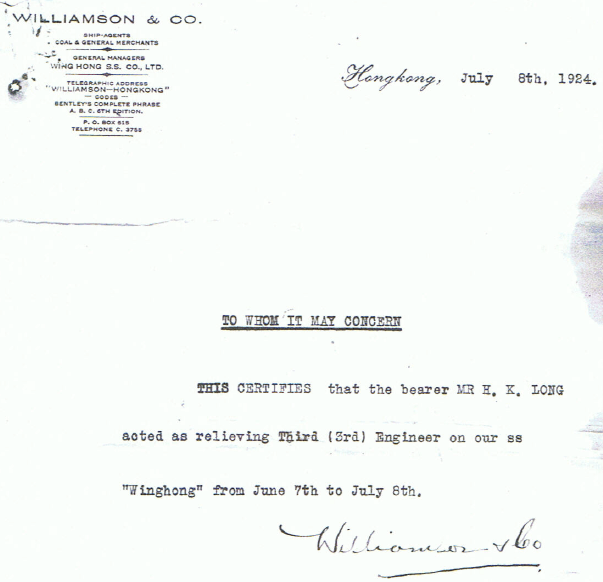 On 8th July 1924 Harry received a letter from Williamson & Co confirming his appointment as relieving Third Engineer on the Winghong from 7th to 8th July 1924. During this period, Harry met all his expatriate Chinese friends, all young men, the Youngsayes from NZ, the Lyens from Trinadad, the Chanaloys from Jamaica, the Chings from Australia. They all came back to Hong Kong and China as rich men. This Seaman’s Certificate of Discharge is dated 10th July 1924. It notes in the section Copy of Report of Character, For Ability – very good, For General Conduct – very good. From 24th November 1924 to August 1928, Harry was back in NZ working primarily for Blackball Coal Mines. Harry left New Zealand again because he received a letter from Albert Youngsaye asking him to join the Hong Kong and Yaumatei Ferry Company. Their head office was in 144 Des Voeux Road, Central. 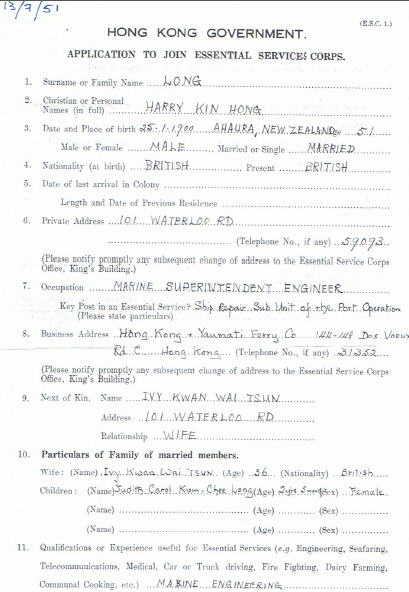 After Harry sent his reference letters and his qualification certificates off to the company, he received a telegram asking him to report to Hong Kong immediately. 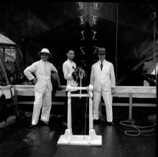 In December 1932, Harry joined the HYF Co as Superintendent Engineer after the first vehicular ferry was built. He was responsible for its upkeep and maintenance and of the subsequent ferries joining the fleet. Harry continued to build new ferries in the Hong Kong Ship Yard, supervising the installation and repairs on all machinery to the requirements set down by the HK Director of Marine and MOT Surveyors. Harry was in this job for 35 years till his retirement in 1965. Please refer to our article, linked below, Harry Long’s WW2 HK experience – Japanese assault and occupation – industrial, transport references for information about this part of Harry Long’s life. 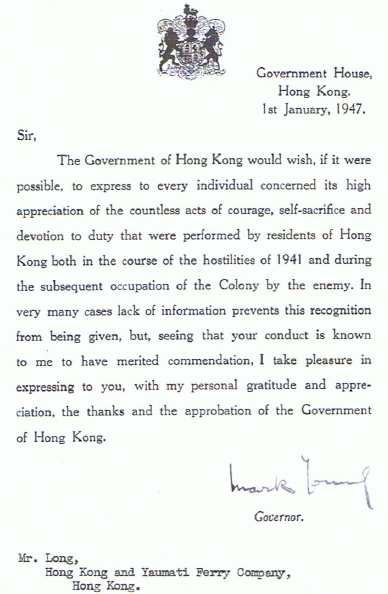 Post WW2 Harry received this letter of appreciation from Governor Young. Note the reference to the Hong Kong and Yaumatei Ferry Company. These photos of Harry are undated. Any help in narrowing down when, and for two and three, where they might have been taken would be very helpful. Stephen Davies suggests the first is on the slipway of the HK Shipyard (owned by HYF) with one of the company’s ferries on the slip being maintained. And the second and especially the third photo are possibly at HWD (Kowloon Docks) immediately post-war when the scuttled vehicular ferries were raised and re-launched. It looks like a fairly big ceremonial occasion, so a launching either of a new ferry or, as suggested, maybe the launch of the recovered vehicle ferries (can’t remember whether the Japanese recovered them – if so, then the complete post-war refurbishment a readiness to be put back into service). This 1951 application form for the Essential Service Corps. lists his special talent as Marine Engineering. 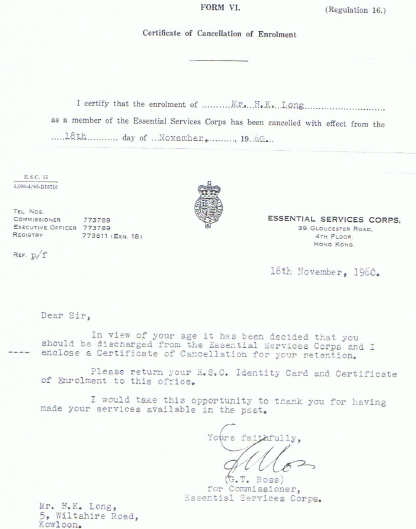 This letter dated 18th November 1960 is his discharge from the Essential Services Corps. This undated SCMP article, though presumably from 1965, mentions Harry Long’s ability “to climb ship’s ladders and complete his duties with agility” despite having lost a leg during the Japanese invasion of Hong Kong. This testimonial to Harry has been extracted from a translation of the speech given by the Chairman of HK & Yaumatei Ferry Co. at the 37th Ordinary Annual Meeting held on 3rd April 1965. Harry worked until the very end of 1965. He then travelled back to New Zealand with his wife Ivy, and his daughter Janice in January 1966. His other daughter Judy was already waiting for them in Auckland having just completed her secondary schooling in Christchurch in December. He enjoyed nearly 20 years of retirement before his death in 1984. This article was first posted on 23 August 2015.